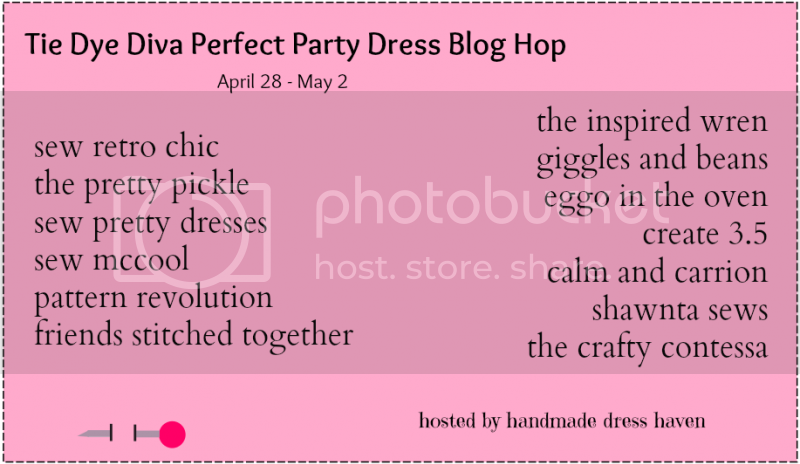 I'm so excited to be participating in an upcoming Blog Hop hosted by Handmade Dress Haven featuring 16 blogger's interpretations of the Tie Dye Diva Perfect Party Dress. First off, I LOVE Tie Dye Diva patterns. Well written, great fit, professional finish, and Jen (THE Tie Dye Diva!) is an awesome gal and always willing to answer questions or give tips. The Perfect Party Dress is a pretty little dress that has some great options included in the pattern. There are two sizes - for baby (newborn through 24mo) and for girls (size 2-10) - - - and they are both just too sweet! I want to help people learn to use patterns in creative ways, not just the one or two ways the designer shows you. We all can't be pattern designers, but we can all think outside the box now and then and get creative! I shared a sneak peek of my creation on Instagram (I'm new there.... so you can giggle while I figure it out!) - - and can't wait to take pictures of it on my adorable niece this weekend! I hope you'll join us - I know I can't WAIT to see what everyone has sewn up - and learn a ton from all their tips!